Found a blocked drain? We specialise in fast drain unblocking! 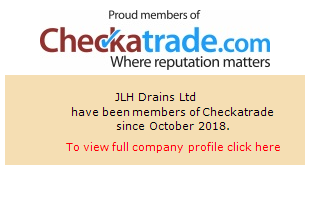 JLH Drains is one of Kent's largest independent drain unblocking, repair and maintenance companies. Using the latest equipment and technology to repair or unblock your drain fast and we're available 24 hours a day! We reach our customers within an hour over 95% of the time!!!! When something goes wrong with your drains at home, we understand you just want it fixed as quickly as possible, with the minimum of fuss and the least possible expense. Of course, often buried in buildings and underground, drain pipes rarely make this easy but with equipment like CCTV inspection kits, drain re-liners and even no-dig drain repairs which effectively install a new pipe without excavation, JLH Drains can make the process as easy as possible. If you've spotted problems with the drains at your home, call our emergency call-out number now on 0800 781 8922. We guarantee to be with you within 90 minutes, more often it's sooner than that. We take pride in the high quality of our workmanship with only the most experienced plumbers and drain engineers working on our team, fully trained in using all the kit and essentials like health and safety, you can feel assured in their expertise. Based out of five sites around Kent our drainage company offers superb coverage for the whole county and most of London, guaranteeing fast, 90 minute response times in an emergency wherever you are. Some of our regular clients are based in; Gillingham, Chatham, Rochester, Strood, Maidstone, Sidcup, Dartford, Gravesend, Sittingbourne, West Malling, Canterbury, Tunbridge Wells, Bromley, Tonbridge, Orpington, Sheerness, Crayford, Sheppey, Margate, Farnham, Woking, Leatherhead, Guildford, Herne Bay, Ramsgate, Faversham, Medway and London. Whatever your requirements for drainage repairs, CCTV surveys, drain re-lining or even pollution control, put it in the hands of the experts at JLH Drains in Kent; contact us today and we can arrange a no obligation survey and quotation with one of our friendly specialists. Fast solutions, competitive prices and the latest systems ensure your drainage problem is sorted quickly and with the minimum of fuss. 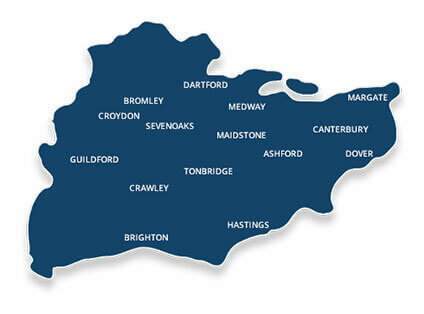 London and all South East areas covered by our mobile teams. Whatever time of day or night, call our 24hr Telephone helpline! We'll provide you with a no obligation quotation and a reliable and cost effective drainage service.